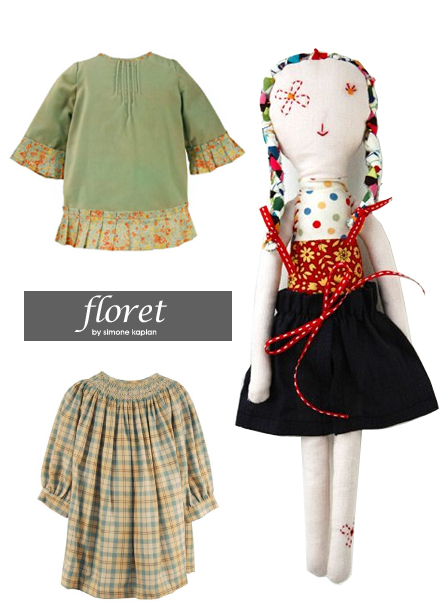 I came across Simone Kaplan's Floret line via a postcard I spotted at a local Brooklyn market - it had one of her beautiful dolls on it and immediately stole my attention. Turns out she also makes children's clothing for both girls and boys. I just had to share some of my personal faves... top one is called Ella and is made of velvet/Liberty fabrics and the bottom dress is part of her Bebe collection and it's handsmocked, wish it came in my size! Nice blog. I am drooling over the font here and there. Wonder how I can have a nicer font on my blog. Also you have three columns. (big sigh)... Always something new to learn, isn't there? Thanks for the inspiration. Copyright © 2007-2009 Wunderlust - Marichelle Burdman. All Rights Reserved.